It says plenty for the one-time power of Daniel Wildenstein’s stable in France that Lianga today rarely receives more than a passing mention behind his other great mares, such as Allez France, Pawneese and All Along. Yet Lianga deserves to be remembered as a tremendous filly on her day, one who demonstrated excellent versatility and toughness during a career that featured six Group race victories over three seasons. While not one of her ten foals came close to matching her ability on the track, her daughters have fared a good deal better at stud - to the extent that today she is the ancestress of three Group/Grade 1-producing stallions in Danehill Dancer, Mr Greeley and Street Sense. 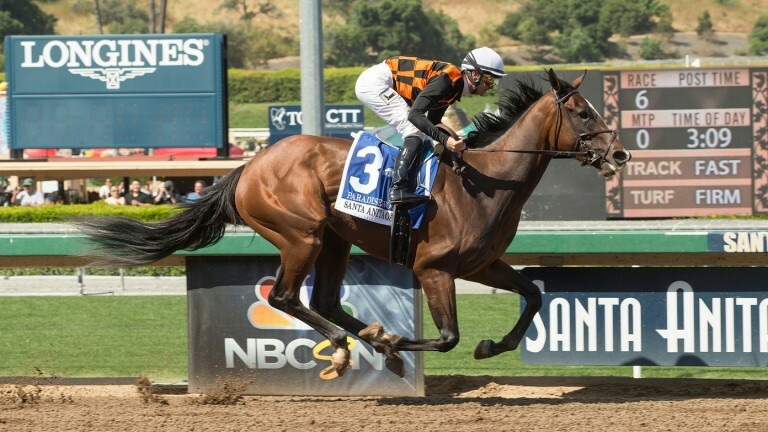 And now, in Saturday’s spectacular Santa Anita Oaks winner Paradise Woods, the family appears to have thrown a filly that may one day prove worthy of comparison with Lianga herself. Few performances anywhere in the world this year have been so dominant. Taken to the front by Flavien Prat, Paradise Woods had them all off the bridle turning for home and stretched clear to win under a hand ride by 11¾ lengths from Grade 1 winner Abel Tasman. It was the longest winning distance in the race’s 82-year history, a feat made all the more impressive by the fact that Paradise Woods was jumping straight out of maiden company on only her third start. Brought along with typical patience by Richard Mandella, Paradise Wood now looks set to consolidate the good start at stud made by her sire Union Rags. A Grade 1-winning two-year-old who won the Belmont Stakes at three, Union Rags was quick off the mark last year as sire of two Grade 1-winning fillies, Dancing Rags and Union Strike. Another filly, Tequilita, won the Grade 2 Forward Gal Stakes this spring while Patch, a welcome male representative for the sire, recently ran second in the Grade 2 Louisiana Derby. Such a start - from a first crop of 106 foals - obviously bodes well for the future prospects of Union Rags and he is bound to have been popular this spring at a raised fee of $50,000 at Lane’s End Farm in Kentucky, who also managed the stud career of his late sire Dixie Union so successfully. Neither will the start made by Union Rags harm perceptions of his relative Declaration Of War, whose first foals run this year: a direct descendant of Vincent O’Brien’s 1966 1,000 Guineas winner Glad Rags, Union Rags is a half-brother to Declaration Of War’s dam Tempo West. Paradise Woods also represents something of a triumph for the Sarkowsky family. The late Herman Sarkowsky bred Paradise Woods out of his homebred Forest Wildcat mare Wild Forest, having bought into the family with the purchase of her granddam, Lianga’s daughter Long Legend, for $100,000 in late 1989. Sarkowsky also bred the sire of Union Rags, Dixie Union. Since he died in 2014, it is his son Steven Sarkoswky who campaigns Paradise Woods in partnership with Martin and Pam Wygod. Foaled in 1971, Lianga was from the second American-bred crop of the Native Dancer stallion Dancer’s Image, the disqualified Kentucky Derby winner who had a spell at stud in Ireland. She was bred in Maryland by Mrs Bruce Donaldson, along with another good European runner from the stallion’s same crop in 1974 July Cup winner Saritamer. Sent to trainer Albert Klimscha in France, Lianga was precocious enough to win four of her five starts at two including the Prix Robert Papin, then a Group 1. Wildenstein subsequently moved her to Angel Penna and she went on to add the Prix Imprudence and Prix Maurice Gheest by five lengths against older horses at three and the Prix Jacques les Marois (by six lengths), July Cup, Prix de l’Abbaye, Vernons Sprint Cup and Prix de la Porte Maillot at four. As that record shows, she mixed it with the best from five furlongs to a mile and, aside from the odd blip, held her form remarkably well. Such brilliance afforded Lianga the best of chances in Kentucky. Stallions of the ilk of Secretariat, Seattle Slew, Alydar and Caro were among the sires of her progeny but out of ten foals, only one, the short-lived Alydar filly Darling Misty, won a stakes race - and that was a Listed event in the provinces. Still, with seven fillies on the ground, there was always a chance that Lianga’s various well-bred daughters would turn the tide. Sure enough her unraced Caro filly, Lettre D’Amour, became the granddam of Danehill Dancer and more recently featured as the fourth dam of Coventry Stakes winner Buratino. But it is Long Legend, her winning 1978 filly by Reviewer, who has had the greatest impact. At the time of Herman Sarkowsky’s investment in the mare in 1989, Long Legend had bred a handful of winners including the Listed-placed Majestic Legend. By the end of 1990, Majestic Legend was a Listed winner while better was to come through her 1992 colt Mr Greeley, the Breeders’ Cup Sprint runner-up who became an important sire for Gainesway Farm. The family fleshed out further a decade ago when Majestic Legend’s grandson, Street Sense (out of Bedazzle), became the first horse to pull off the Breeders’ Cup Juvenile-Kentucky Derby double. Long Legend changed hands again in 1995, this time to agent Charlie Gordon-Watson. But Sarkowsky retained her foal of that year, the Zilzal filly Uforia, out of whom he bred Sir Michael Stoute’s Dee Stakes winner Tajaaweed, midfield behind New Approach in the 2008 Derby. Wild Forest was sold in 2015 by Sarkowsky’s executors for $85,000 to Royal Oak Farm and the mare now has a yearling filly by Blame. Luckily for the Sarkowsky family, she has left behind a filly in Paradise Woods who could turn out to be the leader of her generation. DANEHILL DANCER (93 c Danehill - Mira Adonde by Sharpen Up) won Phoenix Stakes - Gr.1, National Stakes - Gr.1 and Greenham Stakes - Gr.3 Champion sire. Bred by L K and K McCreery. MONA DE MOMMA (06 f Speightstown - Society Gal by Linkage) won Humana Distaff Stakes - Gr.1 and Las Flores Handicap - Gr.3. Bred by Kim Nardelli, Rodney Nardelli, R C Durr & Dr Michael Spirito. Also ancestress of Buratino (G2), Mr Greeley (G3), Ol’ Fashion Gal (G3), Tajaaweed (G3), Unilateral (G3) and Vestrey Lady (G3). A rare private purchase by Juddmonte Farms with an eye on Arrogate’s future stud career, Paulassilverlining justified their investment at the first time of asking on Saturday with a determined win over Constellation in the Madison Stakes at Keeneland. Now under the care of Chad Brown, it was a first Grade 1 success for the daughter of Ghostzapper, a Grade 2 winner for Michelle Nevin last year when also running third in the Breeders’ Cup Filly & Mare Sprint. The success of Cloth Of Stars in Sunday’s Prix d’Harcourt at Chantilly extended a fertile spell for the family descending from Lingerie, also the granddam of recent Prix Zarkava heroine That Which Is Not. Cloth Of Stars, who led home a one-two for Sea The Stars in the race, was bred by Peter Anastasiou but overall this is a line that holds a greater association with the Niarchos family. Lingerie bred four stakes winners for her breeder in Light Shift, Shiva, Limnos and Burning Sunset (granddam of Main Sequence). That Which Is Not, by Elusive Quality, is the first stakes winner out of champion Shiva while Cloth Of Stars is out of her placed half-sister Strawberry Fledge. Even so, perhaps the best is yet to come for the family this year in Ulysses, the final foal out of Oaks heroine Light Shift. It’s doubtful that many European breeders have fond memories of Saumarez, the 1990 Arc hero who became one of a slew of disappointing sons of Rainbow Quest at stud. But he played an interesting background role in proceedings at Aintree last week as the paternal grandsire of Aintree Hurdle winner Buveur D’Air, one of two Grade 1 winners by Haras de la Baie’s Crillon, and damsire of Top Novices’ Hurdle winner Pingshou, by Definite Article. Saumarez initially stood at Haras du Quesnay and wound up in South Africa via a 160,000gns sale through Tattersalls. Andreas Putsch’s Haras de Saint Pair celebrated a stakes double this week courtesy of Prix Imprudence winner Via Ravenna, a homebred daughter of Raven’s Pass, and Prix la Force winner Graphite, a Shamardal half-brother to Grade 2 winner Fairly Ransom. Via Ravenna’s win came on the same Maisons-Laffitte card that Kitkarma, another graduate of the stud, won the 7f handicap. The international nature of High Chaparral’s stud career was illustrated on Saturday when the late Coolmore stallion fired in stakes winners in Australia (Whispered Secret: Listed Fernhill Handicap), New Zealand (Charmont: Group 1 NZ Thoroughbred Breeders’ Stakes; and Mangaroa Flo Jo: Group 3 Manawatu Breeders’ Stakes) and Ireland (Rekindling: Ballysax Stakes). Rekindling is the second Derby trial winner bred by the Pocock family out of the Salse mare Sitara after Golden Sword, successful in the Chester Vase of 2009.